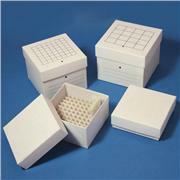 Durable, economical & space saving polypropylene storage boxes for any type of storage. 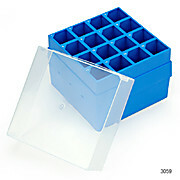 Globe Scientific's cardboard storage boxes are designed for the compact storage of sample tubes, cryogenic vials and centrifuge tubes in a temperature range of -196° to +121°C. They have a liquid resistant coating and are designed for use in refrigerator and cryogenic freezer systems.